This has to be one of the most widely applied-for and widely anticipated Forum Member Reviews of the year. We have 4 amped-up and psyched Forum Members who are testing out the Carbon Ringo 1/4 Putter - the surprise top choice in 2015's MyGolfSpy Most Wanted Blade Putter competition. Did we get it right? 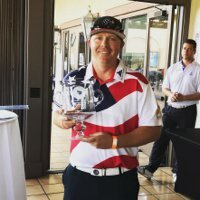 Does this little company in Colorado have what it takes to battle it out with the Scotty's, the Bettinardi's and the rest? What do golfers just like you think of this thing? 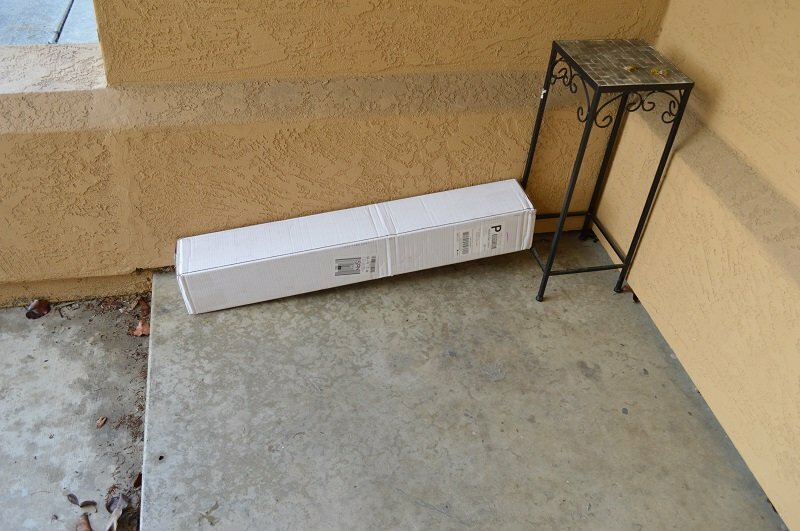 There are few things that will make a grown man go all giggly and excitable like a 5 year old on the eve of christmas, but the phone call from the wife that says that your review putter arrived and is sitting on the front porch at the house will do it. Oh, you mean it wouldn't have for you? It did for me, and I am OK with that. This was an exciting day. Seriously, this is the picture the lovely temptress sends me. Let me take a step back here for a minute. You see, this opportunity could not have come at a better time. I was on a mission to replace my putter. Each 'offseason' I try to pick one area of equipment and focus on replacing it. I try lots of options until I find what I like the best. This year it is the putter, and on the list of options I wanted to investigate was the Carbon Ringo 1/4 that had won the MGS Award earlier this year, as well as last years mallet winner, along with a few others. I had already started that adventure, but to be honest, had not had as much luck as I had hoped. So this day was just a bit exciting. Making matters worse, I knew I couldn't race home to play with it, as I had a group ride to lead that afternoon. To say that the group riding that evening got a workout that was a little more 'spirited' than advertised would be a gross understatement. I was in a hurry. When I got home, I had about a hot minute to play with the box and the putter before I had to shower and get back out the door to a dinner with the family. Needless to say, it did not stay in the box very long. 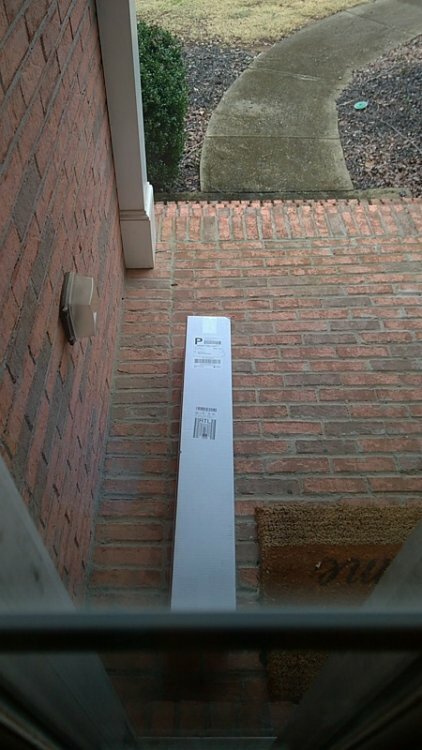 It seems like an awfully large box for just a putter. 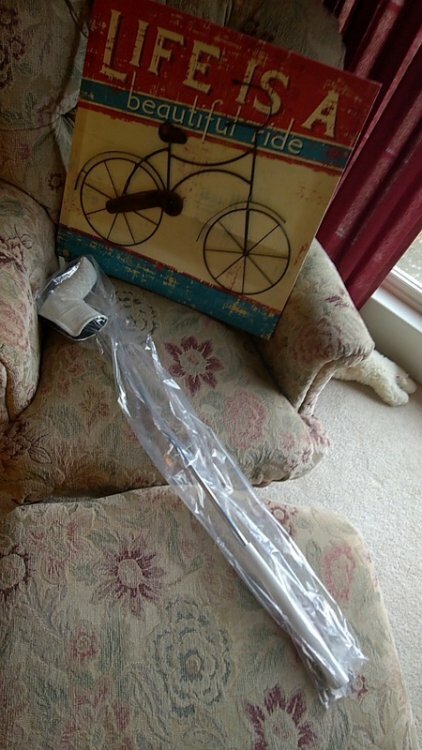 Upon opening it, you see that they are serious about protecting the putter from shipping malfunctions. There is a lot of paper in place protecting the putter and providing a lot of intrusion space to cope with shipping issues. Once out of the box, you still have a plastic protection layer to further protect against scrapes and nicks. I know that shipping can be iffy, but this is serious protection, without the annoyance of filling the entire box with foam peanuts. 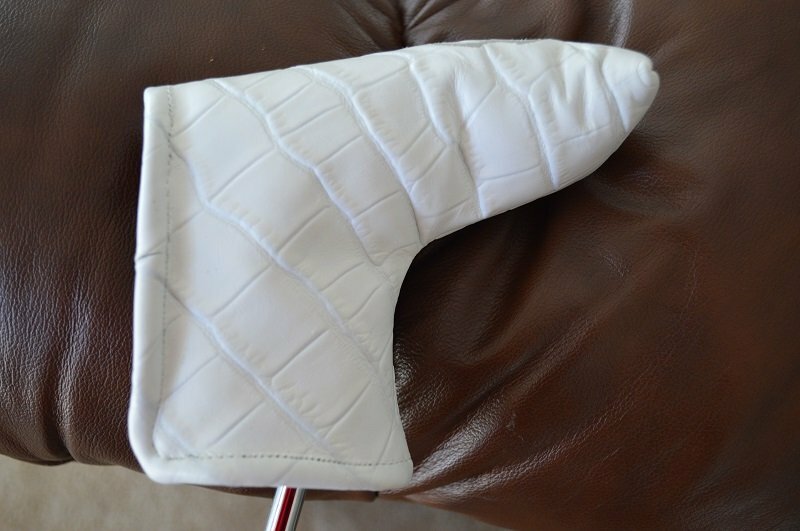 Look, there is even a nice looking head cover, but let's be honest, it's a head cover, we really want to see what is under that don't we? Unwrapped, there are two things that immediately jump out at you. This may look like a dozen other putters of the same basic style head, but it doesn't feel like them. It is not a heavy putter in the style of the old Shark Tank, but it certainly has more mass in the head than pretty much any other blade putter you could grab. The best description is heavy enough, but not too heavy. The other is the stock grip. I'm going to be blunt here. 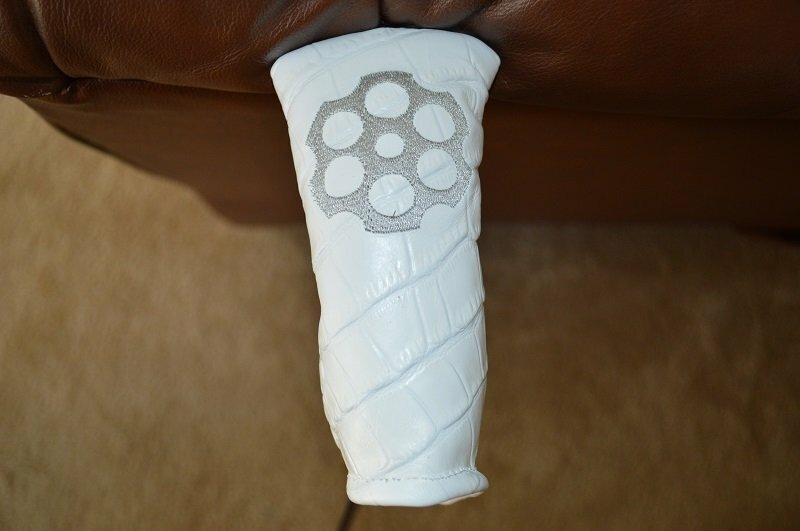 The Pure Grip grip that is the factory grip is so very white. It borders on shiny. It has no visible texture to the grip, and other than the black on white lettering of the CARBON branding, it is visually remarkable in an utter lack of adornment. Then you grab hold and take those practice putts with it, and I find myself having to promise to withhold judgement, but the first impression of the grip is that it might be the tackiest rubber ever. It doesn't need a texture, and a first brush, it almost feels damp. Not slippery at all, but sticky. It will be interesting to see how it feels outdoors on a cold and damp golf course. Finally, there is the face of the putter. The visual details are gorgeous, but the milling in the face is so subtle, and yet even that adds to the character. Looking at the pictures online, I wondered how the black head would look in person, and the answer is, fabulous. I cannot wait to see it out on the turf. There are so many little things, and yet the whole package? this is functional art. The mix of Black and White, the use of subtle milling details, and the inverted colors on the grip. But what about playability? Well, that needs some time out on the course. What I do know is that tapping balls around on the carpet. Well, I am very much looking forward to see how it performs on course. So I have started this review 3 times, and each time struggled to finish it. Why you might ask? well, it seems that the devil is in the details. This is something that I am now certain that the folks at Carbon understand at the very core of their process philosophy. Reading this, you already know how this opportunity came up. So I don't want to rehash that. After reading the reviews on MyGolfSpy earlier in the season, I had this putter on my short list to test this season, as a new putter was in the plan already. Why? Well, for the last 3 seasons I have been using an Odyssey Sabre that I has been good to me, but not great. If I could get it to 18 inches, I was good, but from 18â€“48 inches, I was worthless as a putter with it. Late last season, I went back to a putter that I have had for years. It was what I used prior to the Odyssey, and I was a better player with it, though I had more distance control issues with it. That putter was an old Tiger Shark Tank blade. Needless to say, a â€œheavyâ€ blade was not a huge concern for me. That is not to say that the Carbon Ringo 1/4 is a heavy putter, because it really is not. It is heavy enough to give a well balanced feel without sacrificing the touch that is implicit in the design aesthetic. For me, it was love at first sight. The visual and physical feel is just crisp and lovely. The black and white just works. As we all know though, the real test of a putter is out on the course. This is where things went a little off the rails, and is largely the reason this has taken me so long to complete. At various times in the last couple of months of playing with the Carbon Ringo, there has been love, hate, frustration, and appreciation in nearly equal doses. Worse, many of these things would happen in the space of 9 holes on the course. I blamed the putter. I blamed myself. I blamed the course. The reality is somewhere in the middle, and that is why this has taken so. Very. Long. Let is first address the good things. It adheres to a very â€˜common' head design. In fact, side by side with several other putters, you would be hard pressed to see anything different other than the finish. Speaking of the finish, it is gorgeous. The surfaces are nearly flawless, and the matte black finish with the white trim is aesthetically pleasing. 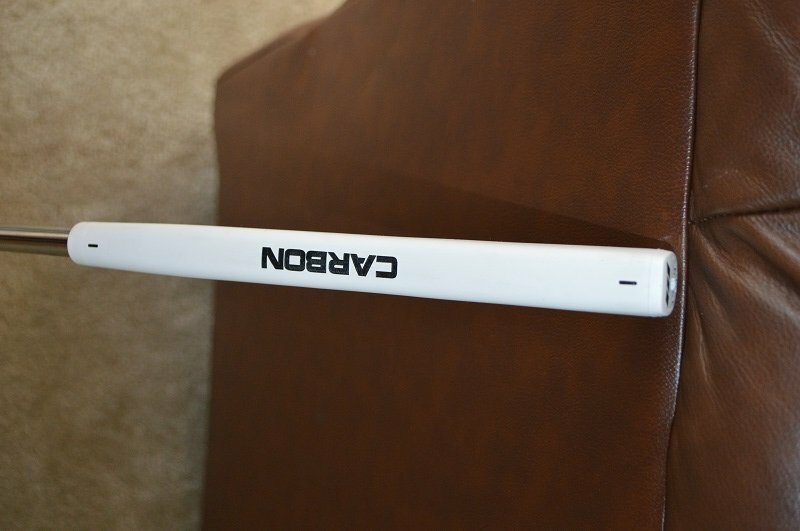 Even the stock grip, a Pure Grips putter grip is visually amazing in it's solid white matte finish with black lettering. The sound of a ball against the face is an equally pleasing sound. All in all, this is the sort of putter that you want to put in the bag and game. It strikes all the right notes, until you get out there in a live situation, and start playing with it. Like all putters, that is where the love/hate relationship starts. In addition, the weight, which seems a touch heavy upon first touch largely disappears on the course, as the balance really is quite spectacular. It is difficult to leave roll the face in your swing, so I found far fewer pull or push putts. Distance control however, was quite frustrating. I am not going to mince words here. I had a great first round with the Ringo. Then I had a mixed round, followed by an awful one. The longer I used the Ringo, the less consistent my putting was, and I was failing to find a rhyme or reason. It had to be me, the putter itself should not have been the issue. I kept fighting with it, determined to figure it out. Eventually, I cracked the code, and it's ugly. Yes, unfortunately, there is an ugly bit. It took a long time to sort out the issues I had using the Ringo. Once identified, the issue was an ugly one, but one that is really not an issue once you grasp it. 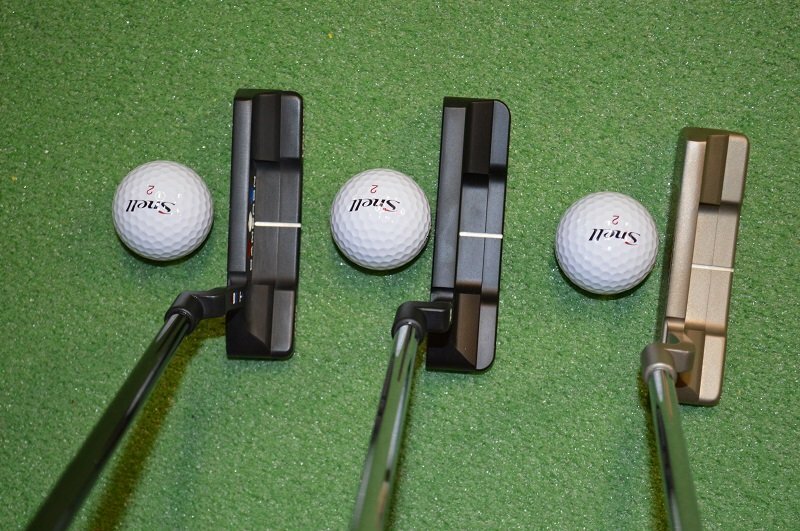 Most putters have target alignment aids, and predictable spaces on the face where they get the best strike and roll. The Ringo is no exception, in fact, for me at least, it is the most complex example of this I have ever used. In the image above, you will see three overlaid circles. The red circle is, for obvious reasons, a poor place to ever strike a putt. Unpredictable results come from this area that is marked â€˜Danger'. Where things get far more interesting is the amber region in the middle. The alignment aid would set up most players to contact the ball in this middle section. If you do this, what happens, or well, specifically, happened to me was that the lines were dead straight, but the distance control was erratic, from exceptionally long to exceptionally short on contact that looked and felt nearly identical. Meanwhile moving further in, to make contact in the green area, particularly right on the face opposite the Carbon logo results in a straight and predictable pace. Solving that riddle, I have found the putter to be an excellent putter, so long as I ensure that I setup inside the alignment aid. To the point where the last 4 rounds have seen putting averages well under 2 per green. The distance control bit bugged me, and I kept coming back to it each time I started to write this up. I had this nagging feeling that I was missing something that should be obvious. The ball was consistent through out ( 2015 Nike RZN Black ). Temperatures ranged from just above freezing to above 85F, but the distance control issues stayed when lining up in the yellow aid area. It wasn't until a practice session hitting a few from the fringe that the answer revealed itself. The height of the swing itself, and specifically the face of the putter was the answer. I do not know enough about physics, and what little I do know would say that what I am about to say is highly unlikely, and yet, the empirical experience says that the issue is all about where on club face (vertically) the ball and putter face impact. The behavior is that the higher up on the ball the sole of he Ringo strikes the ball. the more likely the ball would â€˜jump' off the face. On the counter side, the lower the swing, the more â€˜dead' the ball came of the face, resulting in short putts. Knowing what I know about the putter today, I do think I would purchase it, and happily put it in the bag. However, going in without some of the knowledge I gained in this process, I am not entirely certain that I would have persisted through some of the learning curve of it's idiosyncrasies and quirks. Today, I find that those little details give me more options, and has allowed me to use the putter from the fringe with far more confidence than I ever had with other putters by taking advantage of the quirks that I now expect. At the end of the day, the real question is, will it stay in the bag? Before this happened, I had also ordered a Ping Ketsch to test out. That went back several weeks ago, and the Ringo has taken up a long term residence in the bag, and truth to tell, over the last few rounds, it has become a strength, where there was weakness in the past, so yes, I do believe it will be in the bag for some time to come. I think the real answer is that to love the Ringo means embracing it's quirks and taking what it will give you. 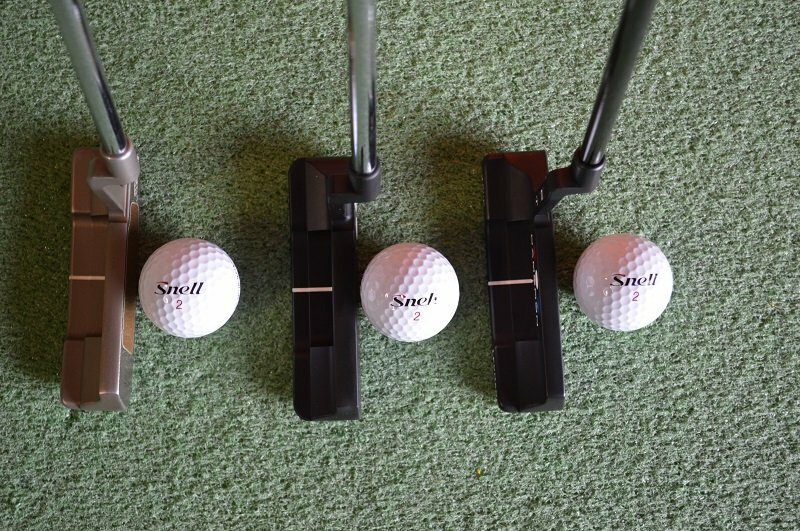 It is not going to solve your putting problems, but like any good tool, if you take the time to learn the tool, it can become a powerful piece of equipment in your game. As a certified Putter Ho I was more then extactic to be selected for this mission!! I have had more then 50 scotties and about 20 other putters from Odyssey, Ping, and TMAG. I have stopped my Putter addiction since picking up my Buttonback 2 years ago. But after seeing the review on the Carbon ringo I have nearly pulled the trigger about 20 times after having a dissapointing round. Once I got my tracking number I was like a kid on Christmas I was checking the tracking 3 or 4 times a day. I ran out to do some Honey do's and while waiting in line decided to chech the tracking and so the single most amazing word you can see DELIVERED!!! Needless to say I skipped my last stop and headed straight home. I put the Turbo to work on my Subaru and made it home in record time to see this amazing sight. It took some serious self control to not rip the box open and run straight to the garage but I did it for you guys haha. I love the clean white box with the Black logo instead of the boring standard box. 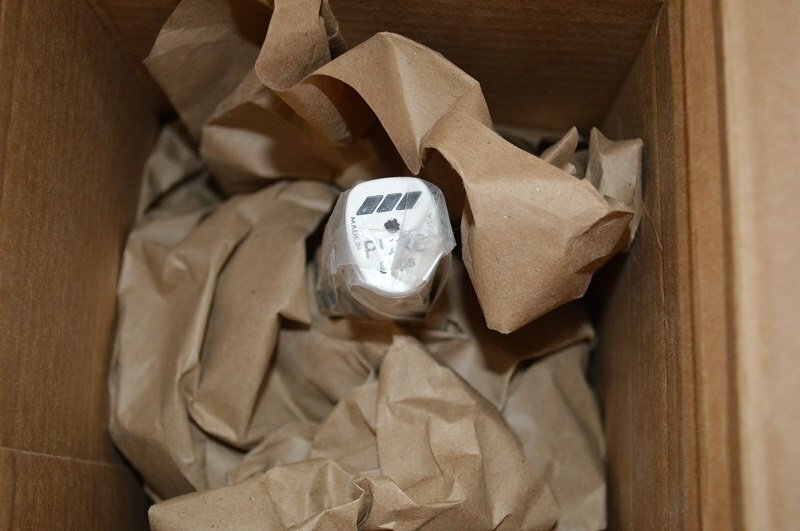 I opened it upo and saw that beatiful white Pure Grip sticking out of the packaging. I pulled out the packaging and there is was wrapped in plastic. I pulled it out of the plastic bag and saw the beatiful white Alligator Ace of Clubs cover. With the very cool and a slightly subtle silver Carbon Logo. Then you remove the cover to see the georgous Black finish and great looking Millng with the great looking Bright White Paint fill. The Black and white contrast is a very classy and bold look. 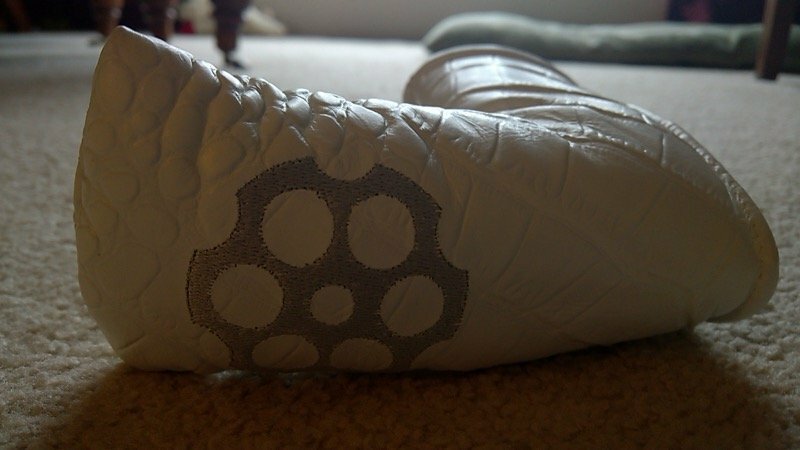 The Carbon Logo the goes from the face to the sole is very cool. I really liked the rear cavity that just has a small logo also. There is no question this a beautiful putter, The attention to detail is second to none. If this Putter performs as good as it looks we will have a winner. The only thing I for see me changing is the grip since I use a Flatso Ultra this thing is very small in my hands. I have had 3 rounds with the putter so far but you will have to wait for my full review for the results. Here is a sneak peek of what is to come!! First off I want to thank MyGolfSpy and Carbon Putters for this awesome opportunity. I will start off with a little bit about me and my putting abilities; I have struggled with putting for a very long time. I have gone back and forth between Newport/Anser style and a face balanced mallet putter. After years of â€œit must be the putterâ€ and over 50 different putters I stuck with my Buttonback Newport 2 and decided to work on my mechanics instead of swapping putters all the time. While working on mechanics and looking for a training aid I found the Tiba Putt. I have been using it for over a year and vastly improved my putting. My typical miss when putting is a push. I use a stat tracking app the keeps track of all this for me I use it every round and used it to compare this putter to my gamers. Gathering statistics for this test I used the Get Real Golf Stats app to track my putting. 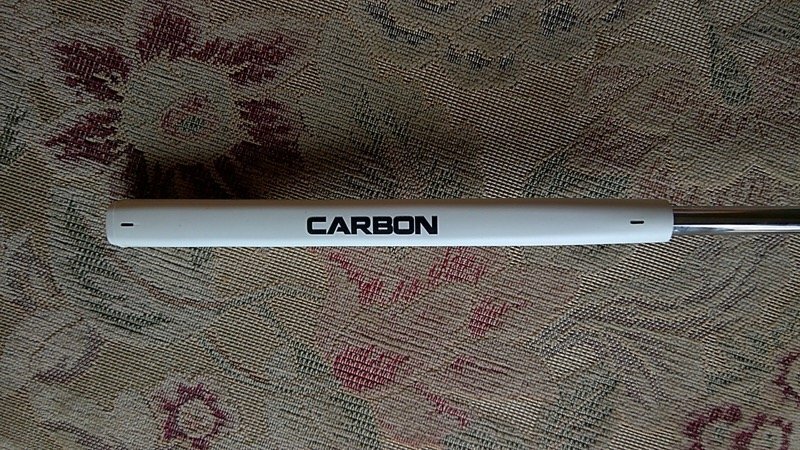 I played 7 rounds with the Carbon Ringo Putter. I used these 7 rounds vs the Previous 7 rounds with my gamer. I didn't play any new course so that I can rule out putting on unfamiliar greens as a variable in the test. I also did many test on the putting green and my practice green in my garage. All testing and rounds were with the Snell MTB!!!! 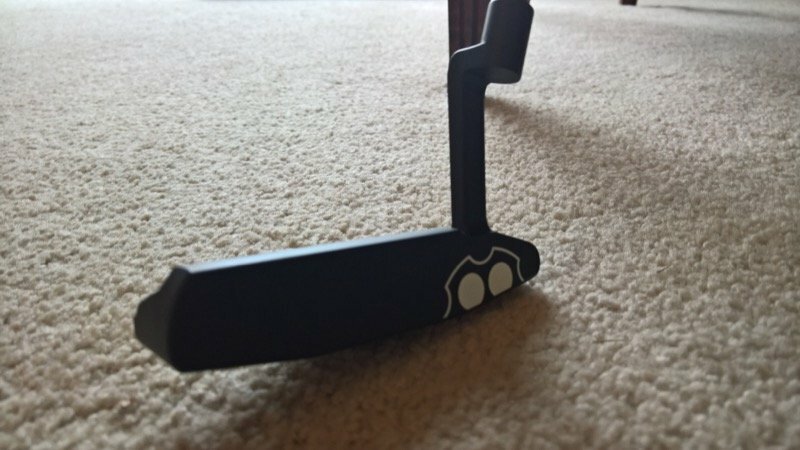 I have looked at buying a Carbon Ringo Â¼ putter since it was rated the best putter during the MyGolfSpy testing. I thought it was a great looking putter and had it in the cart several times but never pulled the trigger because I had my Buttonback. This is a style of putter that obviously fits my eye and works for my putting stroke. I have seen many of upstart putter companies pop up over the last few years and thought this was just another company copying a classic style and making it just slightly different. 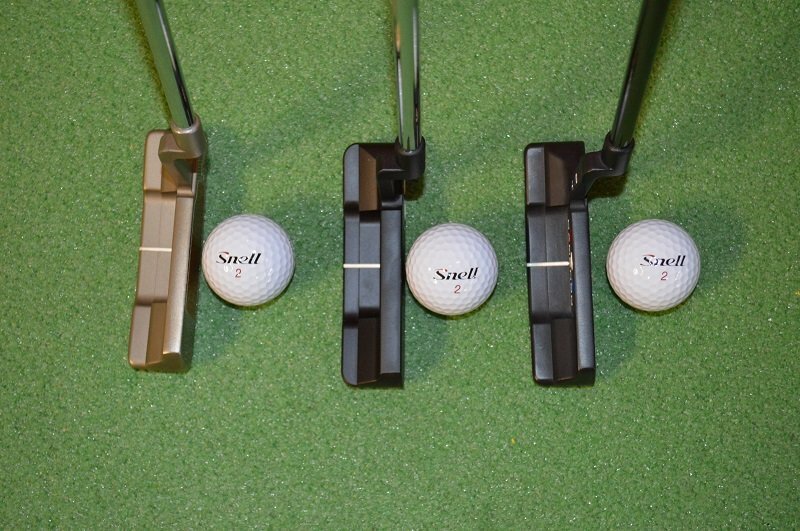 Things I look for in a putter are very simple a classic look and solid yet softer feel. I want a putter that is balanced. Putters I have used in the past well there is just way to many list. I have had over 20 different Cameron Newport Models, 1 Arm-lock, 1 belly putter and over 20 other face balanced mallets. 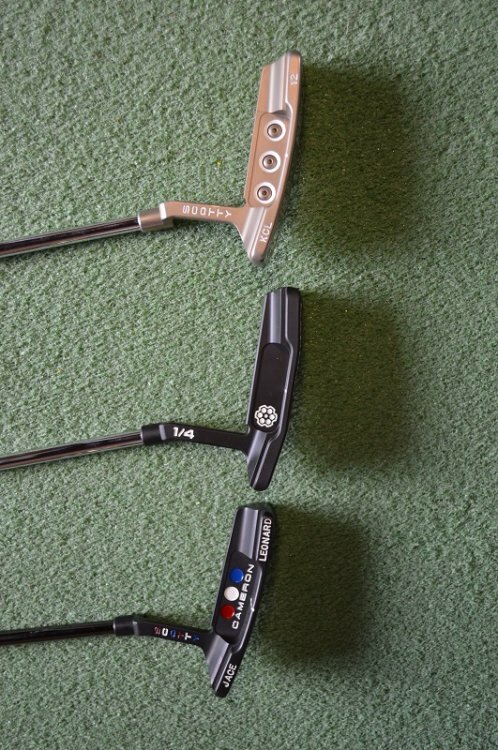 The Newport 2 has been my favorite style and I keep a Ping Craze in the garage because I putt well with it and for the story of how I got it. I switch to the Flatso Ultra Grip last year and have put it on every putter I have had since then including the Carbon Ringo. When it comes to looks with the Carbon Ringo Â¼ its second to none!! 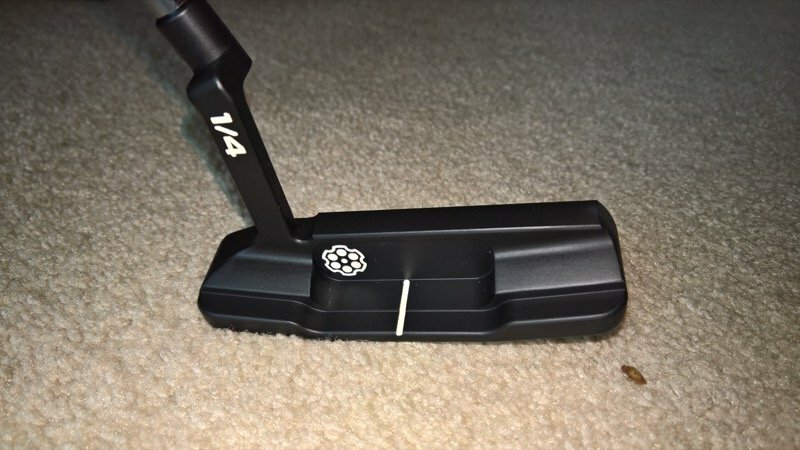 This is a beautiful putter the deep black finish and the contrast of the bright white paint fill is a classy and refined. There wasn't one time playing golf or on the practice green that someone didn't ask me what kind of putter I was using. After they all looked at the putter they said â€œthat's a great looking putterâ€. 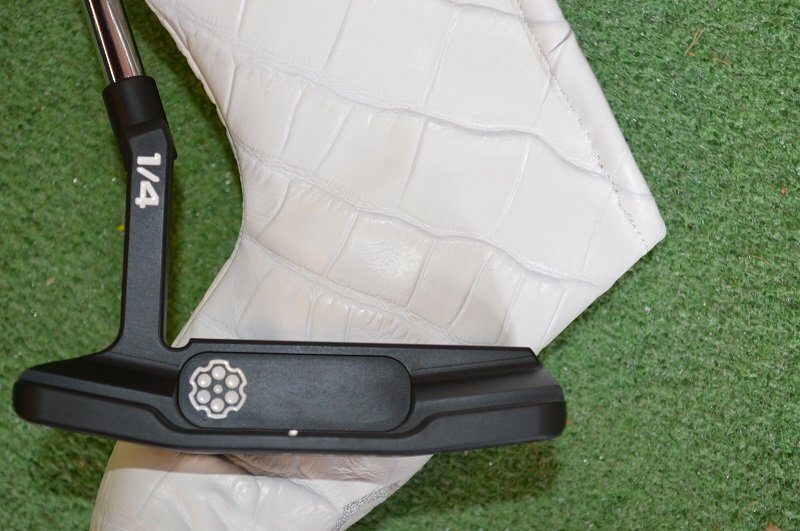 The design and headshape is perfect, the lines are clean, its just a classic looking putter. Lets start off feel with how it feels off the face. The feel off the face is exactly what I look for solid yet soft. Using the Snell MTB for all testing eliminated the difference in feel based off the ball. 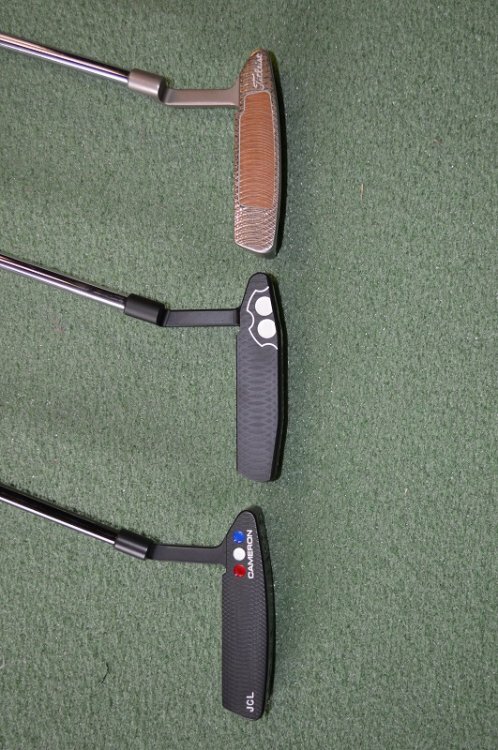 I noticed that the putter had the softest feel about Â¼â€ closer to the heel side of the center of the putter. I still try to hit every putt directly out of the middle of the face. The sound of this putter is just as good as any Newport I have used. I can only describe it as a muted click. It is very pleasing to the ear no complaints here. I put in a lot of time on the practice green trying to love this putter and get used to it. I did tests from 3, 6, 10, 20, and 40ft I hit 15 putts from each distance 5 straight, 5 L to R, 5 R to L. To try to normalize the result better the Ringo and Newport 2 I did each test completely through then waited 20 minutes while hitting balls and chipping to get the feel of the putter out of my hands. Alignment and aiming with this putter is every easy and there is no guessing if I was aiming where I was trying to aim. I missed left with the putter at an alarming rate. I usually miss right and thought this putter would counter-act that and make me better. It did that to a point as the stats show below inside 10ft. From 3, 6, and 10 feet this putter shined for me. I made more putts with the Carbon then my Gamer. With my Gamer I made 32 of 45, with the Carbon I made 37 of 45. That's a pretty dramatic difference to me. From 20 and 40ft is where this putter was just not good for me. I made 11 of 30 with my gamer and just 4 of 30 with the Carbon. But this isn't the biggest problem for me it was the huge disparity in distance left from the hole when missed. With my gamer I average 2ft 1â€ from the hole which is a pretty good even for me. With the Carbon I averaged 4ft 9â€ from 20ft they were only 3â€ difference the biggest difference was from 40ft. With the Ringo I averaged 5ft 1â€ nearly 2ft farther then my gamer. This is where for me I based most of my opinion from on this test. I took my last 7 rounds with my gamer and the 7 rounds I played with the Ringo. Using the GRGS app I tracked all my putts. Concentrating on Putts/Round, 3-putts/Round and misses also I should note the GIR was the same 11. First the stats from the previous 7 rounds 29.13 putts/round, 0.83 3-putts/round and miss percentage 61.2% right and 8.17% long(more then 2 ft past). 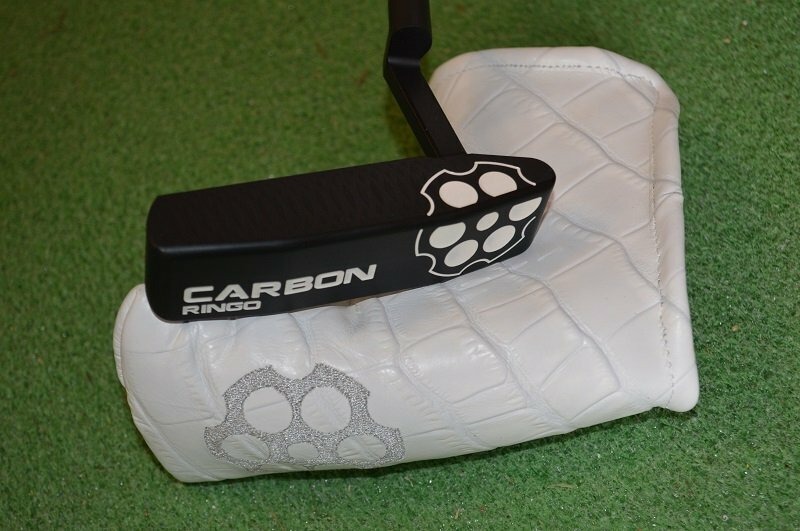 Now for the stats for the Carbon Ringo 32.96 putts/round, 2.97 3-putts/round, miss percentage 53.4 perfect left, 21.1% long. The stats speak for them self here. The heavy head just gave me fits from outside 10ft. I play my Gamer at 353 grams and the extra 22 grams head weight just made distance control a huge guessing game. I wanted this putter to perform for me so badly but it just didn't on longer putts. I had all the confidence in the world inside 4 ft which I typically struggle with when the pressure is on. With be able to test it extensively now I am glad I didn't pull the trigger earlier. I would not purchase this putter now. It's not because of feel, looks, or performance inside 10ft. It's simply the distance control issue. Could I eventually get used to it? Maybe but I would have given up sooner if I didn't want to love this putter and write a real honest review for you guys. I have lost a pretty good amount of money using this putter for 7 rounds in-fact probably enough to almost pay for the putter. All other stats were the same during these rounds. Same Fairways hit, GIR, etc the only difference is the putting stats. I averaged 3 strokes higher per round with the Carbon. While this putter didn't work for me it doesn't mean it's not a great putter. The looks of the Ringo is second to none. The feel of the putter and roll produced is as good as anything out there. The craftsmanship and quality if the product is top notch this includes the Ace of Clubs Cover which is flat out the best looking stock cover in the Industry. You won't find a better looking cover in my opinion. The Pure Grip is a great grip and looks great but for me it made the head fell to heavy so I replaced it with my gamer grip the Superstroke Flasto Ultra. The heavy head just caused me fits on longer putts and that far outweighed the improvement I saw inside 10ft. If this putter was 350-355 grams it would likely remain in the bag. Again I understand that would counteract the design of the putter. Delivery - Nothing beats putting any kind of order in and having it arrive earlier than expected. 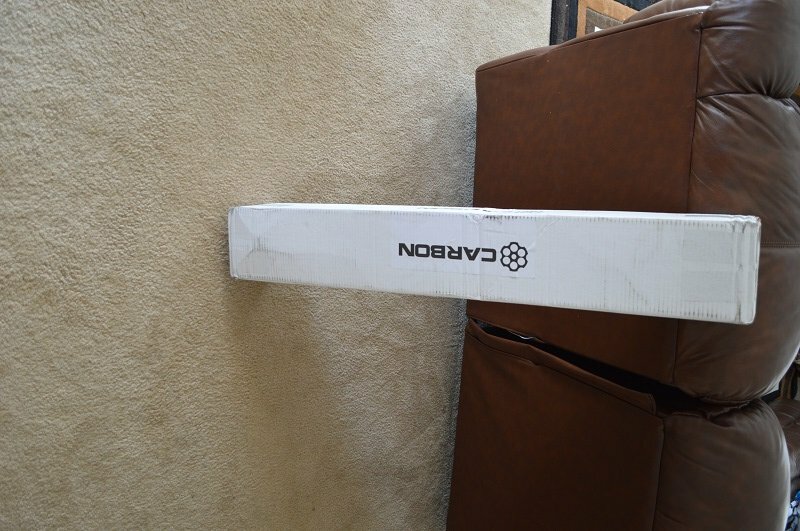 With a two prong effort between Carbon Putters and UPS, an amazingly fast delivery was made. Wow, were they quick or what! Carbon Putters pulled out all the stops to ensure our testing experience was all it could be; and nothing beats getting off on the right foot. 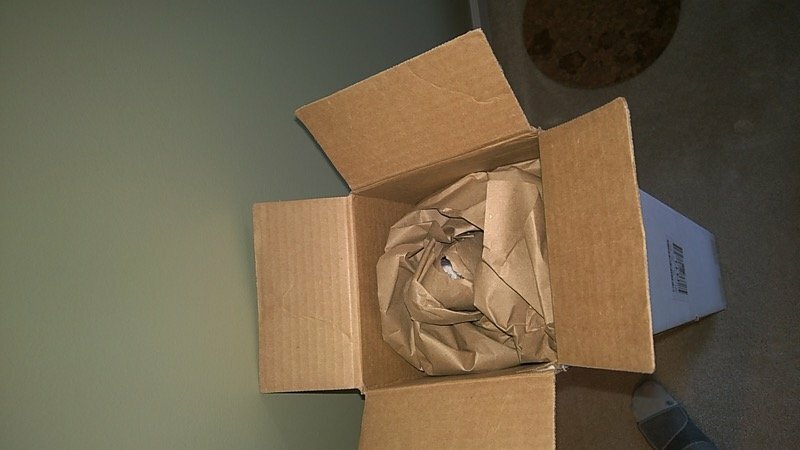 Packaging â€“ What can you do with cardboard to enhance the purchasing experience? 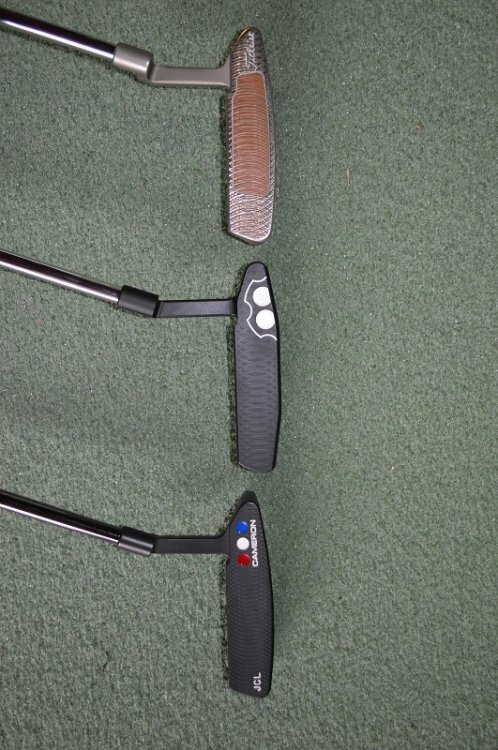 Face it, Carbon Putters are on the high end of the putter market spectrum. So how do you tell the buyer he and his (or her) shiny new putter are special, you encase that delicate instrument of moss dominance in a snowy white container and bold black lettering with a name that evokes the guts and strength of a Pittsburg steel worker (carbon) and an image that warms every NRA members heart (a revolver's cylinder). It reminds every American that Col Colt helped to build a nation one bullet at a time (or six in this case). The six-gun revolver cylinder is without a doubt an interesting touch and will require more research in its use at Carbon. I like to think it has some tie to the putter's name â€œRingoâ€ as that creates an almost gun-slinger attitude when you stroll confidently on the practice green. Carrying on the white/black theme, the striking finish isn't gun-slinger flashy but notably a non-glare flat black finish. This contrasts the bleach white stamping and alignment line. Face it, it just looks ready for business in every way. It seems only fitting the box exterior and over all cosmetics of the putter would match to perfection. It screams â€œClear the streets, Ringo is in town and he's gun'n for some 3-putt'n mullet w/a Scottyâ€. But let's not get too far ahead. We've barely let this gun-slinger out of the barn. Once you've broken the seal, you find out how personalized this has become. 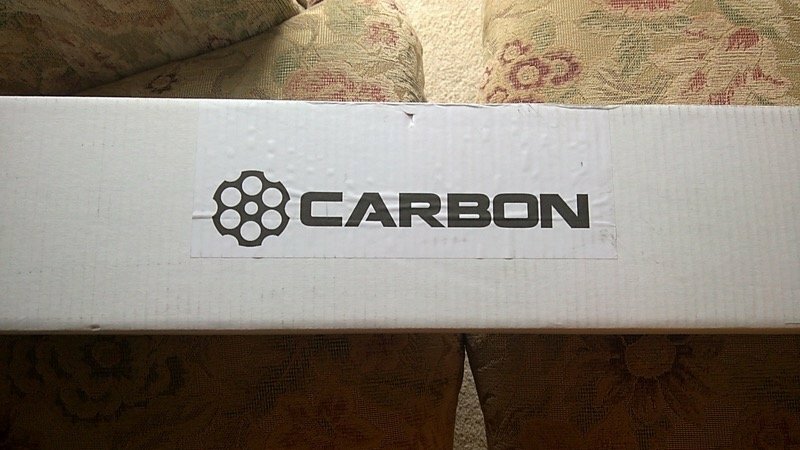 Along with a head cover that requires its own review, is a letter from the folks at Carbon Putters. A few details on the materials and social niceties but once again, when you talk about spending money for a single club like this, a letter to YOU goes a long way. THANKS. And now the head cover. Only a 5x beaver Stetson could have been more appropriate for this gun-slinger. 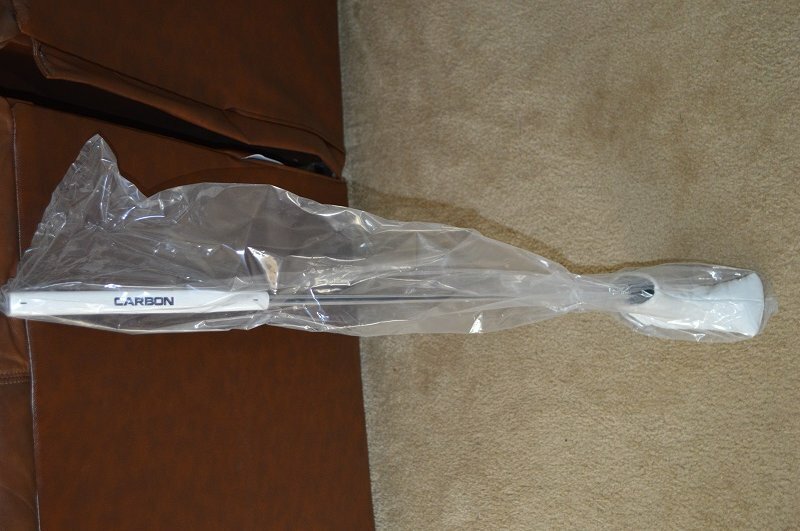 This Ringo sports what has to be the most beautiful head cover out there and once again, the folks at Carbon maintained the bleach white with gray accents all the way from the box, through the club head, through the grip (more on this later) and to the head cover. And to top off this â€˜accessory', only a faux alligator embossed print would do. Being from Texas, I have to say, this is perfect. No gun-slinger sporting the name Ringo would be caught dead in anything but alligator boots. How apropos! So far, every aspect screams â€œtake me on, I dare you; I'll one putt your lights out and leave you lying in the fairwayâ€. (Of course the whole metaphor fails miserably if Ringo refers to the drummer. My review, so gun-slinger it is). First, you should ask yourself a few questions and be honest: why do you love your putter, why do you hate your putter and finally what will take to make you happy. Obviously, if you're dropping 20 footers and Jordan S has left messages on your phone wanting to buy YOU dinner, you're probably not in the market to make significant changes. But we have all played a round or two with the guy who has the latest, greatest and most likely the most expensive solution on the market and couldn't find the bottom of the hole if he was reaching in to pick someone else's ball out of it. But he will persevere with no solution in sight other than wait for the next Sunday morning info-mercial or troll the websites for the latest WITB (what's in the bag) of the latest money winner. So we know why he loves his, but what about the guy who has an original BullsEye from his high school days (most likely from an era when kids could walk to and from school) and hasn't missed a 4' putt since bell-bottoms were cool and Johnny Miller could still create a reverse C.
You have to like what you look at; plain and simple. Your putter needs to sit on turf like elves took measurements during the evening and cobbled away building a magical device just for you. BEFORE you reach for your putter, you should have a wave of confidence, no excitement, where that little voice in your head says â€œthese guys are going to be floored when they see this dropâ€. That is when you have found your putting nirvana. 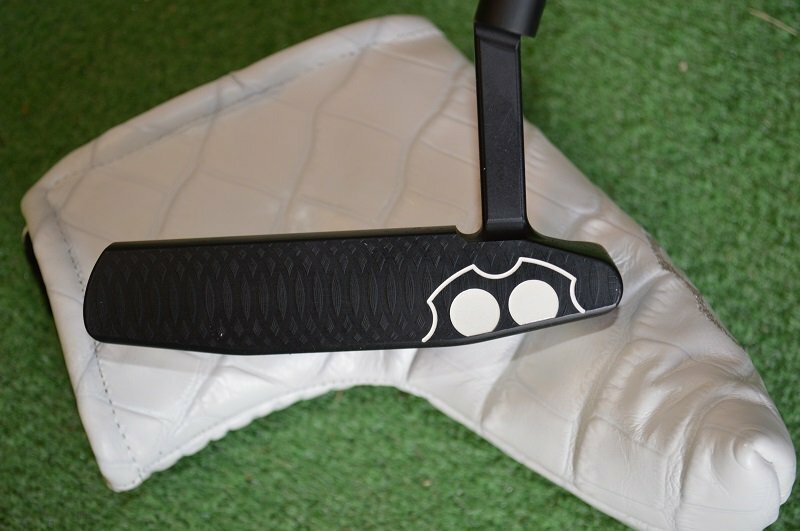 Is the Ringo Â¼ by Carbon Putters an instrument of putting nirvanaâ€¦.maybe. The performance aspects are soon to come. For now though, this owner is taking in the sheer beauty of the craftsmanship and technology built into the Ringo. Understand I am, a self-proclaimed club mechanic. Club specs, club fitting and general game optimization is my hobby. I've been a follower of many of the game's club designers and the philosophies behind the science and esthetics of all the clubs in the bag. This club truly fits well in the upper echelon of putters on the market. Later we will talk about feel and why I believe Carbon made some of the design features and how they impacted feel One example is the extremely subtle milling on the putter face. Many of you out there realize the degree of surface features affects the â€˜click' when struck. The Carbon has an amazing compromise between the latest face milling of the Newport and older ultra-flat milling on a variety of putters. (more milling relief and the feel can be somewhat softer and potentially quicker roll while the flat surfaces combined with certain metals can yield a distinctive â€˜click'). 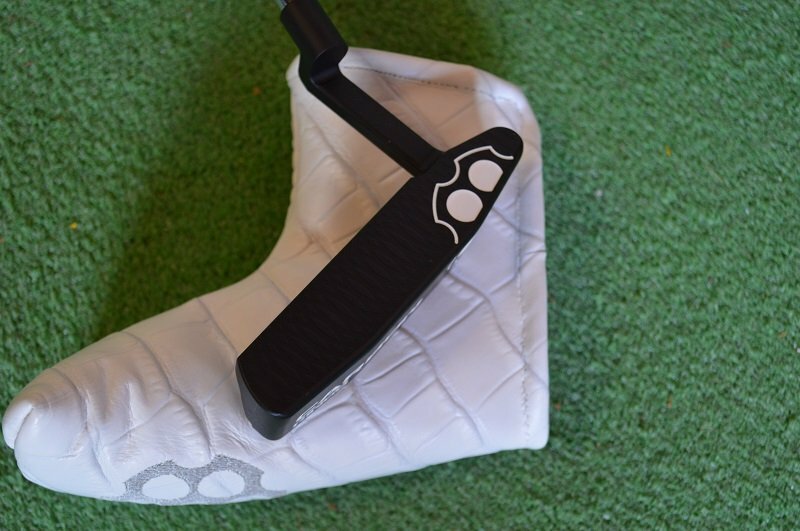 The elephant in the room for anyone that has read anything about this putter, or picked one up is the weight. Without a doubt, you will notice it. But right away you will also notice the takeaway is very much under control. Paying attention to swing path in both directions is one of the big difference between the pros and us shmos. I was recently at Cool Clubs in Dallas for a putter fitting with my wife. Her hole in one afforded her a new putter and trip to real pros in club fitting with all the lasers and high speed cameras. The thing that found most interesting was the comparison of pro putter paths to amateurs. This is where I believe the Ringo Â¼ may have a measureable impact. As part of my review, I intend to saddle up the Ringo and head to Cool Clubs and prove the point. 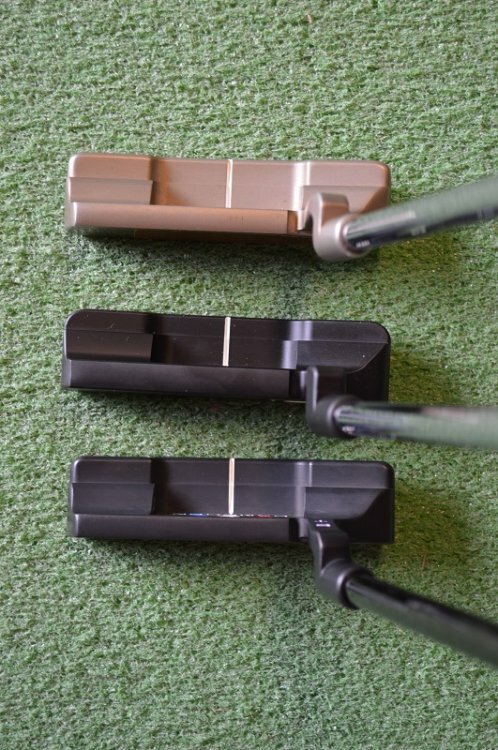 The MySpy shootout and Carbon Putters took everyone by surprise and the readers here are a savvy group that want to know WHY. Next we'll take a look at on-course impressions and testing. The results so far have been surprising in some cases and shocking. â€˜Nirvana'. A descriptive term used way too much in association with putters but everyone instinctively knows the writers intent. To capture the overall impressions of the Ringo Â¼ from Carbon Putters, we need to get everyone on the same page with regards to â€˜Nirvana'. Picture your monthly medal and you know you've got at a minimum, 1st or 2nd place in the bag. You're in the last group and a 14 footer is all that stands in the way of both a 72 (5 under your handicap) and a triumphant victory in front of all your peers. You know the line like you know the way to the bathroom at 3 o'clock in the morning. You draw the putter head away and allow just the weight of the putter to propel you bleached white rock dead straight into the hole. Perfection. Does the Ringo assure a victory â€“ maybe. But we need to look back over the many weeks of indoor and outdoor testing that have taken place. The Ringo wasn't just fondled and knocked around a few nines. This baby was thrashed around by some of the best the Woodlands had to offer. Indoor testing was done on a 14' BirdieBall putting mat that stimps at 9 one way and 12 the other. 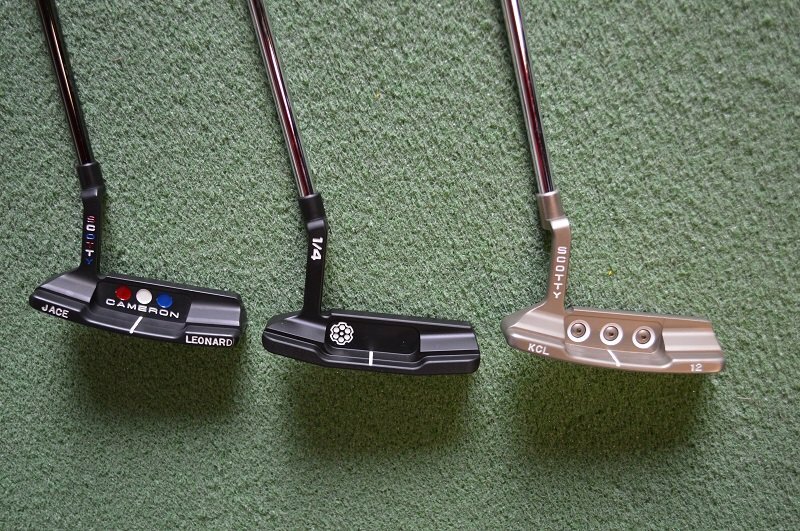 The first impressions section of the Ringo were honest and the pointâ€¦Carbon Putters make a truly attractive club. The only options I would have to recommend to any buyer would be the addition of the spent bullet case that Carbon will insert in revolver chambers in the logo. It looks so cool. The overall appearance, flat black with distinctive white lettering definitely catches the eye of those around you. Most golfers are â€˜equipment centric' (face it, that's why you are here reading this). We all instinctively scan the bags of those we play with as well as those around us. Your sticks do tell others a lot about you and your game. We recognize brands, color patterns and shapes and are drawn to anything that looks remotely different. But I digress. How does the Ringo putt? Remember the spaghetti western the â€˜good', the â€˜bad', the â€˜ugly'? The putter shootout last year was so spot on its not funny. From 7' in, this is a weapon. I can't believe the ease and consistency from inside 8'. I took some time (actually a lot of time) to control my hit instinct with this putter. When the putter is drawn back and allowed to fall into the back of the ball, that 370 gram head perfectly â€˜moved' the ball to the hole. Over and over and over andâ€¦. THIS IS THE GOOD part of that movie. Depending on the consistency of my approach shot or chip, if I was even close to inside 8', life was fantastic. In fact, the pressure to roll a chip inside 4' was gone. Just anywhere near the hole and up-and-down was a gimme. But since I'm no pro, and greens around here are pretty good sized, lengthy first-putts are a norm (that is the BAD; nothing to do with the putter but not getting approach shots anywhere near the hole is killing me). So far we touched on the GOOD (inside 8') and the bad. Now the UGLY. From outside 8', an amazing thing happens. I might get 2 putts perfectly lagged to the hole but out of the blue, an approach putt will go MILES past the hole. I mean WAY pay (I'm sorry officer, I was cleaning my putter when it went off in my hands type of thing). I tried everything including a putting lesson. The pro even said, you should consider a different putter. Well that is certainly not a problem since my closet looks like everyone else's'â€¦piles of straight putters, bent putters, face balanced, center shafted, heel shaftedâ€¦.. you get the point. I compared the Ringo to all of them. The rouge lag putt only showed up with the Ringo but nothing would come close to its consistency inside 8' as well. All in all, the craftsmanship is impeccable. 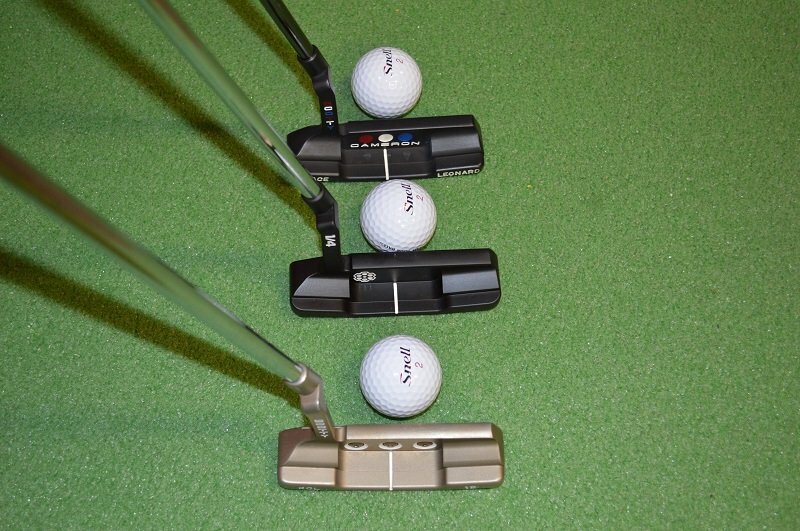 The consistency on what should be the most crucial putts is unmistakable. But the inability to control what becomes the majority of putts for me, the lag putt, sets me up for an unwanted 10-15 footer coming back when you least expect it. I should also add I solicited A LOT of other player's opinions on the Ringo. A couple completely disagreed with my assessment and fell head over heels with it. Neither had a lag putt problem and both felt it solved their current dilemma w/ knee-knocking 5 footers. 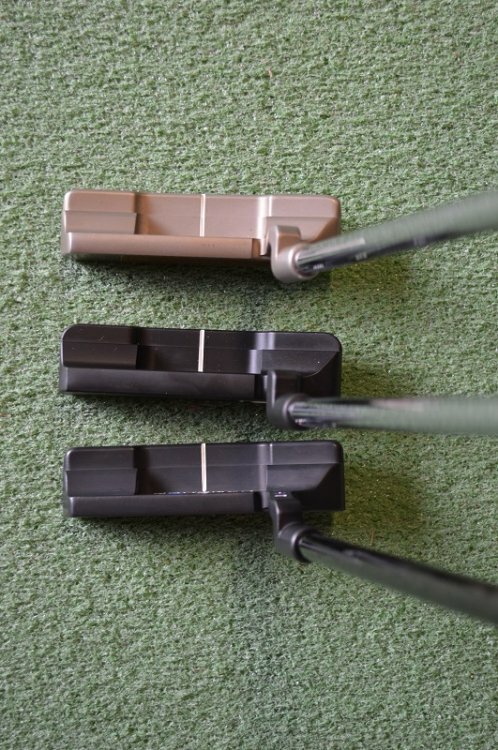 So, horses for courses; try before you buy; stick with quality and buy American (did I mention Carbon Putters is a Denver based family business). Epilog: I am still using the Ringo but alternating with my Yes Callie. Same styles. A lot depends on how I'm hitting approach shots. Our boys are in the air!!!! Initial First Impressions are up. Just Posted my Intial Impressions Check it out!! I'm absolutely delighted to see that there's no non-offset, face-balanced model available yet. I don't need any more temptations to spend more money. OK...Finally getting some info up here as this is my first post and review for MGS. I am really psyched to try this puppy out as you will see below I am still playing with the same putter I used for High School and College golf and I am 52 years old. I wanted to get something up here first before I officially review it but my first impressions are "It's time for a change and this RINGO can be the one. As you can see I like bald putters but someone yesterday told me I can get about $1000 for this old baby, but before I take the money and run, I need to have full confidence that the Ringo is for me. Steve resize your photos to 800x600 then attach them. Once the are attached you can add them to the post wherever you would like them. KCLeo12's first impression is up! I really like the look of these. 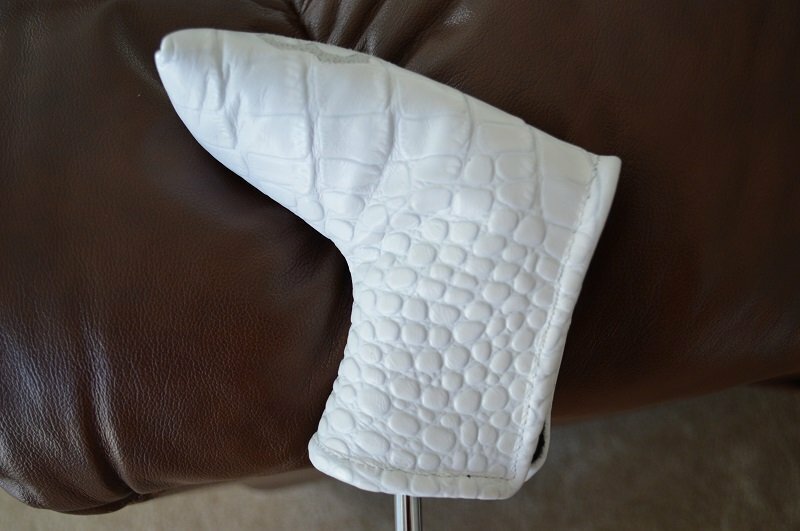 The white alligator skin head covers are really cool. 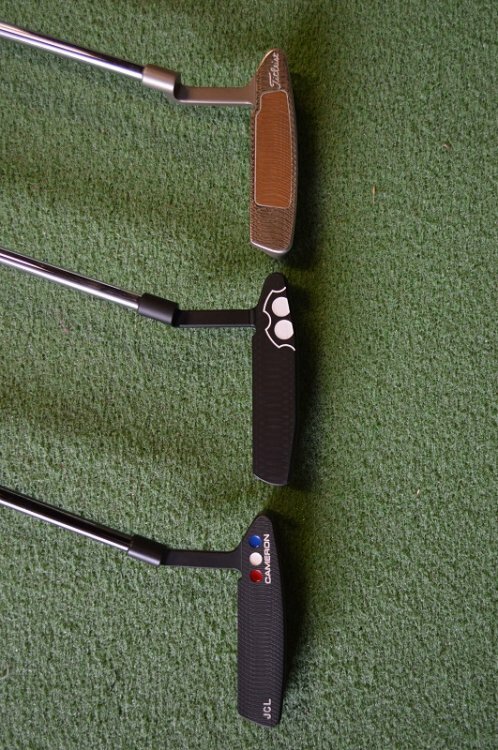 I am an organic chemist by training so obviously these Carbon putters are at the very top of my list. The carbon black finish is perfection. Keep the reviews coming! 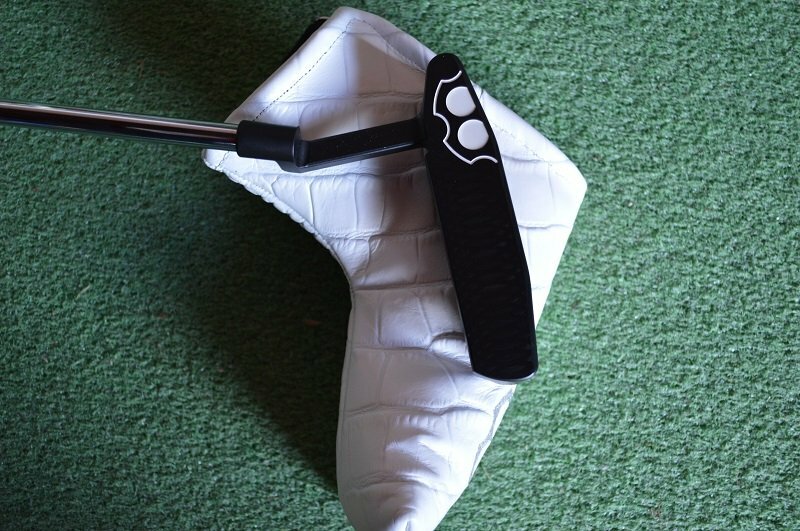 ChemClub this putter is beautiful and feel great also. If you can adapt to the heavy head weight on your longer putts you will love it. I'm getting caught up after some nasty weather and travel. Will have my review up over the weekend! Sorry for the delay!